It’s quite tough to pick a multipurpose tool while going for outing, hiking or camping since there are a number of eminent tools available. And, it’s not suitable for you to take several tools on a trip as the extra burden will result in severe problems. While you are out there, whether you need to make firewood, clearing brush, prepare food or face some survival issues, kukri can be your best friend. That’s why we have decided to review the best kukris so that you can easily buy from them. Kukri, an inwardly curved Nepalese knife, can be used as a tool or a survival weapon. It’s such a powerful and useful weapon that many regiments including the Nepalese Army, the Royal Gurkha Rifles use Kukri as their characteristic weapon. But picking a perfect kukri is really challenging. Let’s see if we can lessen that challenge. This Ka-Bar 2-1249-9 Kukri is our second pick for the top kukri list of the market. It comes with an 11 and ½ inch carbon steel blade that has an awe-inspiring sharp edge. Its forward weighted light blade enables you to make a powerful strike. 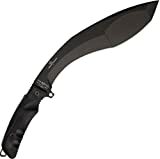 And, this Ka-Bar kukri can be used for camping, hiking, batoning, clearing brush and for survival as well. In fact, you can name it as your survival kukri. 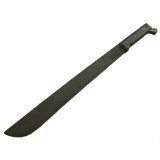 There are also many top quality machetes for survival. The full tang blade normally holds its coating for a long time unless you abuse this beast abnormally. Its Kraton G thermoplastic elastomer-made handle is surprisingly balanced and always has a lanyard hole. As soon as you unpack it after buying and holt it, you will feel excellent comfort in your hands. This magnificent tool from Ka-Bar has placed in our handpicked top machetes list. This sturdy kukri includes a black leather and Cordura combination sheath. The sheath has a D-ring loop that can be used to add to the belt. A sheath with D-ring loop swivels smoothly, so anyone can easily sit while carrying this kukri. This Ka-Bar kukri is an exemplary match for its price. But it’s not for those whose who want something to reach out since its blade is not too long and it’s not a heavy chopper. This marvelous SOG SOGfari machete is a superb addition to the family of SOG. You shouldn’t ponder whether you should buy one from their collection or not, rather which one would be the perfect fit for you! And, I’m not joking. Their machetes are that good! The blade is made of high carbon steel which is 12-inch long. For a kukri type, that’s quite impressive. The most unique and amazing feature is the saw back of the blade. It has an awesome real-working class saw back like Gerber Gator machete that cuts very deep with the double ground teeth it has. The regular edge side is curvy like any other kukri. The 3Cr13 made hard cased-black blade is 18-inch in overall length. The blade is very solid and strong because of the full tang construction. So, it exerts real whipping power when you swing it through the air. The weight of the SOG feels just perfect when you hold the Kraton rubber handle in your hand. The handle is a real comfort for gripping and doesn’t slip away from your hand in wet conditions. It has a spiked tang at the back for scraping and pounding. There is a hole in it for mounting lanyards which enables safety and control of the user. The sheath that comes along is made of nylon. The machete fits quite well within the sheath. Its quality is not top of the world but at this low price, it’s a bargain buy. The hardness of the blade lies between 44-50 in the Rockwell hardness scale. 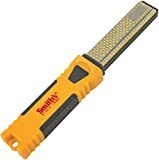 So, it can really chop hard, cut brushes, blaze trail and protect you from any wilderness danger. You can also use it for making shelters, harvesting crops, hunting or even preparing meals! So, let’s explore with the SOG! Cold Steel Gurkha Kukri Plus is our top pick of the list and can be your all-time best chopping and self-defense blade. If you want a great durable tool from a renowned brand and budget is nothing for you, you must try this all around beautiful Gurkha kukri plus. This excellently balanced and significantly hefty kukri is 17-inch long. This is full tang and has a 12-inch blade which is thinner out towards the tip, so it can pierce excellently pretty much effortlessly through thick targets. The blade steel thickness is 5/16 inch meaning thicker than a quarter of an inch. It is a very nice balanced chopping kukri as well as a formidable weapon with just extreme cutting and piercing capabilities. Its hand guard near the top of the handle prevents fingers from cutting. The blade needs regular maintenance like most of the kukris. It will last longer if you clean and oil it properly. This great tool comes with a durable Kraton handle which is nicely gripped and has an oversized brass lanyard hole. With this comfortable grippy handle, you can easily use this hell of a kukri. This kukri has every feature to be your all in one tool. The sheath is very nice and secure. It offers nice reinforcement that the blade is locked in place whenever the kukri is stowed properly. It has lots of eyelets and lashing slots. You can easily carry this kukri with your other gear or pack while going outside. The sheath has loops that can be used to carry it with your belt. One issue with the sheath is, it doesn’t breathe. Therefore, the blade can get rust easily if you place it in the sheath with moisture. So dry it before keeping in the sheath. If you are looking for a tough kukri which is substantial for the roughest adventures, meet this Genuine Gurkha Hand Forged Kukri from Nepal. This superior full tang fighting tool is a great combination of weight, balance, and craftsmanship. This 15-inch long kukri is handmade by born kukri makers called “Bishwakarmas”. Its blade is 10-inch long and made of highly graded carbon steel (car & jeep spring leaf). It is easy to sharpen and holds edge perfectly. And, this hand-forged kukri is gigantic having 9mm thickness at spine. You can use this as a utility knife and a weapon. The 5-inch blocker gripper handle is made of rosewood with natural finger grooves. Those finger grooves may seem little explicit than some modern kukris. So sometimes you may find this kukri a little slippery mostly in wet or sweaty condition. But it has a lanyard hole to help you out. Its sheath is a good news for leather lovers. The sheath is made of refined buffalo leather. So, a hand forged kukri in a leather-made sheath, a great combination for aesthetic lovers. The sheath has loops to be used for hanging or tying purpose. This kukri comes with two additional small utility knives called Karda and Chakmak. The Karda is one edge sharpened and used for smaller tasks which cannot be done with the big kukri. On the other hand, the Chakmak is unsharpened on both sides and used to sharpen the main kukri. If budget is not a problem for you, I will definitely recommend this best kukri for money. This is another gigantic hand forged kukri from ex Gurkha khukuri house in Nepal. 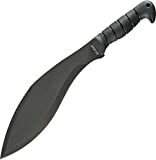 This Gurkha Aeof Kukri has extra length and thickness than above reviewed Authentic British Gurkha for Iraqi operation. That means it is much more powerful and sturdy than the first one. This is handmade by born kukri makers. This 16-inch Gurkha kukri has an 11-inch long blade made from tremendously high-quality carbon steel (car & jeep spring leaf) which will last for a long period of time. Besides, at the spine, the blade is 10 mm thick. So this kukri is great for survival, combat and what not. Now, this beast needs a proper handle for support. It comes with 5-inch rosewood handle which supports the full tang kukri nicely. It has finger grip and lanyard hole. Since the kukri is hand forged there is slight variation in all the kukris. The sheath is brown in color and made from refined buffalo leather. Two additional small knife called Karda and Chakmak comes with this kukri. They are very much handy. Karda is the sharp one and is used for small tasks like skinning animals. 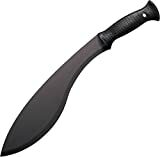 Chakmak is the blunt one and used for sharpening the kukri. If you are looking for a hybrid tool that will perform both as a kukri and a machete this OKC kukri knife is for you. This American made full tang kukri has a distinctive blade shape which stands as a flawless piece of craftsmanship. Its 12-inch blade is made of 1095 carbon steel and can be easily sharpened. Having unquestionably durable edge, this Ontario kukri knife can be your best multipurpose tool for camping. This kukri is amazingly forward curved than most of the traditional kukris. Its black coating is quite tough and does a great job of protecting the blade. It weighs only 18 ounces, so great for your bug out bag. This Ontario kukri has G-10 handle with finger grooves that makes your grip precise and secure. Its handle will rarely slip while using with a wet or sweaty hand. The handle is comfortable and the balance is top notch. It includes a lanyard hole and feels very smooth every time you hit something. It comes with a basic but not cheap sheath. The sheath is made of nylon and includes a plastic liner, riveted belt loop, and a small D-ring loop. So you can easily carry with your belt while moving. The snaps are strong. So in easy terms, in this range of price, the kukri and the sheath is quite unbeatable. 97KMIGS Royal Kukri Machete was redesigned by Cold Steel President Lynn C Thompson. Since then, it has become an outstanding multi-functional tool. It can easily perform in the toughest bushcraft chores, chopping firewood and can be a great choice for self-defense. This 20 and ¾ inch kukri has a 15 and ½ inch blade which is made of 1055 carbon steel. Its 2.8 mm thick blade is protected by black baked anti rust matte finishing. It comes fully sharpened out of the box. This forward balanced impressive big knife is something between a hatchet and a generic machete which can be a superb match for your next outdoor adventure. This exceptional piece of craftsmanship has a 5 and ¼ inch long polypropylene handle with a lanyard hole. The top to bottom textured handle is very grippy and suitable for use with a wet or sweaty hand. Besides, it has a finger guard on the upper portion that protects the user’s finger from cutting due to slippage and its enlarged bottom part prevents it from slipping away while swinging. Big men can also use this kukri comfortably due to its excellent handle. The Cor-Ex sheath isn’t something fancy but secures the kukri from affecting. It has three straps to snap the kukri in place. One for the handle and other two for the blade. Overall, the kukri is a great deal for its price. You get what you pay for. Schrade SCHKM1 Kukri Machete is a good choice for budget lovers. It will fulfill the purpose of a medium machete and large knife. Outdoor enthusiasts can definitely try this 19.7-inch kukri. Its 13.3-inch blade is made of reliable 3Cr13 powder coated stainless steel and weighs 1.44 pounds. It has a nice tough powder coating which is different from other machete’s paint-like coating. The blade is nicely designed to make each swing more efficient. Its length and curved structure maximize the chopping power. 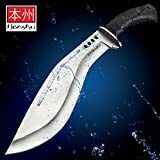 From soft vegetation to preparing firewood, deep penetration to rough chopping, this kukri with speed holes will help you out from all situation and has hardly any match. It comes out of the box with paper cutting sharpness. This full tang Schrade kukri has a Safe-T-Grip handle with front quillon which is extremely ergonomic and safe. The handle is nicely textured with rubber so that wet or sweaty handed people find no difficulty using this kukri. Besides, it includes a lanyard hole. The well-shaped handle accelerates its chopping power. The handle feels good and fits nicely in hands. Schrade SCHKM1 kukri comes with a convenient polyester sheath with a removable shoulder pouch, shoulder strap, leg strap, and belt loop. So you have maximum options to carry this kukri with you. Moreover, the Schrade gives a Ferro rod and a sharpening stone along with the kukri. All these bonus items make this kukri a good candidate for best kukri in the world. The name says what this tool can do. This kukri plus machete from cold steel is quite affordable and light. So, this 18-inch tool is a great option for backpacking. It has a 13-inch blade which is made of 1055 carbon steel. The blade is 2.8 mm thick. This full tang black coated kukri can serve you greatly in clearing brush, camping and so on. But we should keep in mind that, at the end of the day we get what we pay for. 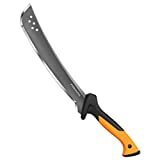 Since this is a cheap machete, it will not impress you like a pricey item. Yet, it will do the job. The 5-inch comfortable and durable polypropylene handle supports this long tool perfectly. The handle is designed to be ergonomic and has a lanyard hole. It will allow you safety and a secure grip even in rough weathers. In spite of all those positive sides, the handle is not actually as impressive as other expensive kukris in this list. The finger guard is great for extra support and safety. It comes with a workable sheath which may seem disappointing in most cases. The sheath is made from Cor-Ex material. The sheath protects the kukri and enables you carrying the tool outside. But it is not the best one. Cold Steel 97MKM Magnum Kukri is overall 22-inch long. Its 17-inch blade is straighter than regular kukris. Its weight-forward balance enables it to bite deep with every stroke. So, this tool is ideal for clearing fields, chopping tall weeds and cutting through dense branches. The full tang magnum kukri is really durable and can take a hell of a beating. It has a thickness of 2.75 mm. It is not hard to sharpen the kukri and holds an edge well. Its nicely textured polypropylene grip is comfortable enough. It has a lanyard hole to increase security. The handle is designed to support this sturdy kukri and ease the use of this great tool. 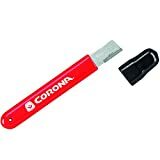 This ok tool comes with a decent Cordura sheath. It has a nice tip and snaps to hold the kukri in place. With its loop, you can carry the tool with your belt very easily. But, we should not expect something top notch with this price. In short, this kukri is strong, made of good steel and can take a pretty good beating. It will accompany you for a great deal of time. To buy best quality kukris from the market, you need to know certain things. We have covered the detailed buying guideline for your convenience buying. After buying your desired kukri you should know some safety guidelines. Also, you will need the perfect sharpening tools to sharpen your blade. These will help you to have a wonderful experience with your tool. If you can choose an ideal one from the best kukris, it will utterly ease your next adventure and make your journey more comfortable. In the worst case, it will save you. Our detailed article will help you in this matter, no doubt.